Vandalia-Butler’s Caitlin Plummer shoots a jumper Wednesday night. Vandalia- Butler’s Evan Neely grabs a rebounds between three Piqua players Wednesday night. 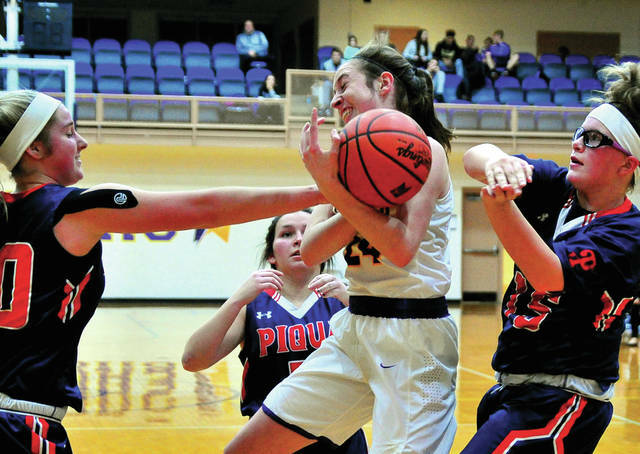 VANDALIA — Piqua girls basketball second impression was not as good as the first. And a lot of that had to do with Vandalia-Butler’s defense. 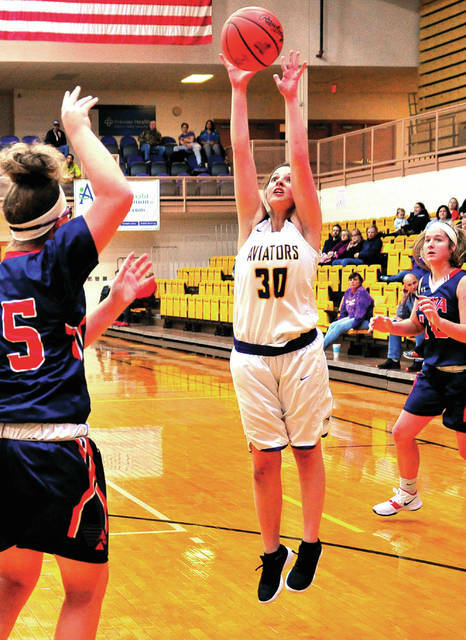 After a 61-30 win over Graham Tuesday, the Lady Indians struggled to get anything going in their half-court offense in a 41-23 loss to the Lady Aviators Wednesday. Both teams are now 1-1 on the season, with Vandalia going to 1-0 in GWOC American play and Piqua dropping to 0-1. Piqua took its only lead at 3-2 with 6:05 remaining in the first quarter on a length of the court pass from Karley Johns to Tylah Yeomans for the layup. Caitlin Plummer hit a three for Vandalia to give the Aviators a 7-3 lead, before Izzy Kidwell answered with one for Piqua. But, Gracie Price and Abbie Schoenherr both scored to give Vandalia and 11-6 lead after one quarter. When Price hit a three midway through the second quarter, Vandalia led 16-8 and the Aviators took a 23-12 halftime lead. Aubree Schrubb had Piqua’s only field goal in the quarter. In the third quarter, it was Vandalia’s turn to struggle from the floor. The Aviators hit just one of 13 shots and when Yeomans hit a three at the third-quarter buzzer, Piqua trailed just 27-21. However, Vandalia would score the first 10 points of the fourth quarter to put the game away. Evan Neely started the quarter with a free throw. Jacie Dalton followed that with a three and Tyree Fletcher added four straight free throws to make it 35-21. Schoenherr added two free throws to make it 37-21, before Schrubb banked in a long two with 2:31 to go for Piqua’s only points in the quarter to make it 37-23. Vandalia then scored the final four points of the quarter to finish off the win. Schoenherr led a balanced Vandalia attack with 11 points. Price scored seven points, while Fletcher pulled down seven rebounds. Yeomans led Piqua with 12 points. Schrubb scored six points and Kidwell pulled down six rebounds. Piqua was eight for 36 from the floor for 22 percent and five of six from the line for 83 percent. Vandalia was 13 of 40 from the floor for 32 percent and 12 of 15 from the line for 80 percent. Piqua won the battle of the boards 29-19, but had 29 turnovers to Vandalia-Butler’s 19. The Lady Indians will host Bellefontaine Saturday, hoping the third game will be the charm. Izzy Kidwell 1-0-3, Tylah Yeomans 4-3-12, Karley Johns 0-2-2, Aubree Schrubb 3-0-6, Kenzi Anderson 0-0-0, Chloe Stewart 0-0-0, Andrea Marrs 0-0-0, Hailey McPherson 0-0-0, Raegan Toopes 0-0-0, Skylar Sloan 0-0-0, Kathy Young 0-0-0. Totals: 8-5-23. Jacie Dalton 2-0-5, Abbie Schoenherr 3-5-11, Gracie Price 3-0-7, Tyree Fletcher 1-4-6, Evan Neely 1-1-3, Caitlin Plummer 1-0-3, Olivia Follick 0-2-2, Ella Neely 1-0-2, Megan Allen 1-0-2, Rachel Burton 0-0-0. Totals: 13-12-41. 3-point field goals — Piqua: Kidwell, Yeomans. Vandalia: Dalton, Price, Plummer. Records: Piqua 1-1 (0-1), Vandalia 1-1 (1-0). Reserve score: Vandalia 42, Piqua 25.